Jio user gets free 2 GB extra data every day: Reliance Jio has once again brought the Geo Celebration Pack for its users. Live Jio Celebrations Pack is giving 2 GB extra data per day to some of your customers. Last time the Jio user was given extra 10 GB of data for 5 days. But this time this offer is only for 4 days, this means the Jio user will get only 8 GB of data free this time. Recall that the Jio Celebrations Pack was launched in September last year, but Reliance Jio had extended this offer up to November for some of its special customers. According to the report of Telecom Talk, Reliance Jio is rolling out Geo Celebration Pack with validity of four days. If you wish you can check into the MyJio app and check whether you are being given additional data or not. After opening the Moi Geo app, you have to go to the My Plans section. Data is refreshed around 12 o’clock every night, as you can see in the picture as well. 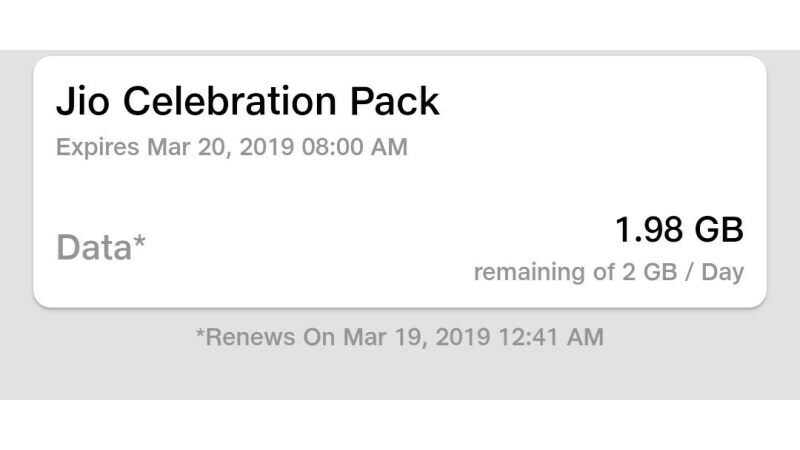 Some users shared the picture on Twitter and informed that they started getting a Geo Celebration Pack. As we told you that Reliance Jio last year launched the Jio Celebrations Pack with 2 GB of data per day. But the company had extended the legitimacy of the pack to November for certain users.